Composition is a very broad but important term in art. Art is not just about being able to accurately render a scene. It is the visual form of music and you are the composer. Composition in art is essentially the arrangement of visual elements using various principles and techniques. It is often used to describe the overall design of a painting. A well composed painting will intrigue and invite the viewer and help communicate the artist's statement. Line: The visual path that enables the eye to move within the piece. Shape: Areas defined by edges within the piece, whether geometric or organic. Texture: Surface qualities which translate into tactile illusions. Tone: Tone is essentially a color which is not a pure hue, white or black. Space: The space taken up by (positive) or in between (negative) objects. Depth: Perceived distance from the observer, segmented into foreground, background and optionally middle ground. The visual elements are arranged with consideration to a number of principles known as the principles of art (otherwise referred to as the principles of design or organisation). Composition involves arranging the visual elements with guidance of the principles of art to promote the artist's statement. Unity is achieved when the artist's statement is aligned with the composition. Rhythm: Creating a visual tempo through the use of repetitive elements. Balance: The arrangement of elements to create a feeling of balance and stability in your painting. Emphasis: The arrangement of elements to place emphasis on desired areas in your painting. Gradation: A gradual change in a certain element to help connect the composition (long lines to short lines, large shapes to small shapes, dark to light tones, etc). Harmony: Using similar elements throughout your painting to create a general sense of harmony. Variety: Using different elements to create interest and contrast. Movement: Creating a visual sense of movement in your painting through the placement of elements (for example, short, bold strokes in a painting would give the indication of movement and activity when used in contrast to long and muted strokes). Proportion: The relative size of one element in comparison to another. There are a number of composition techniques used to help achieve unity in a painting. These are discussed below. Simplification is one of the most important skills you can learn as an artist. The master painter's used simplification to reduce the clutter in their artworks and enhance the focal points. Simplification is most effective when combined with targeted complexity. This can be a powerful combination which you can use to really emphasise areas in your painting. The value range very limited, outside of the relatively bright red lights. This really channels the viewer to those bright areas in the painting. 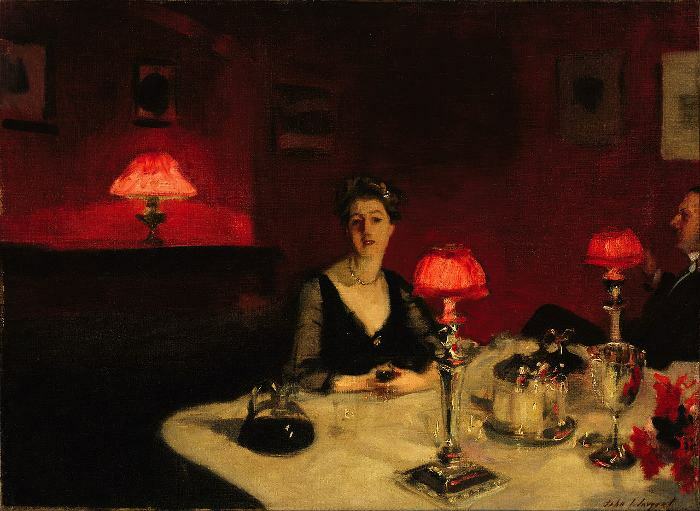 The color range is also very limited, with John Sargent using mostly different tones of red and gray. The background has very little detail compared to the rest of the painting. This helps focus attention on the foreground, where there is much more activity. The brush work is very loose and suggesting, which aligned with the generally dark lighting in the scene. 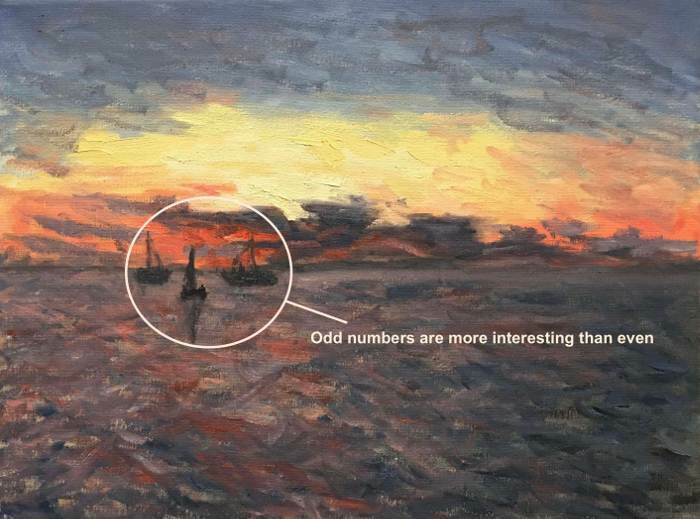 The “rule of odds” suggests that an odd number of subjects in an image is more interesting than an even number. An even number of subjects produces symmetries in the image, which can appear overly formal and unnatural. An image of a person surrounded / framed by two other persons, for instance, where the person in the center is the object of interest in that artwork, is more likely to be perceived as friendly and comforting by the viewer, than an image of a single person with no significant surroundings. The rule of thirds is a technique used to ensure the focal point of your painting is not directly in the center and that your painting is not overly symmetrical. What it entails is cutting the scene into thirds both ways. You will end up with nine sections. The aim is to place your focal point at one of the intersections and to ensure none of your sections are the same. In general, a focal point which is directly in the center of the painting is not visually appealing for the viewer as it bisects the painting and appears unnatural. The rule of thirds is thought to be a simplification of the golden mean. The golden mean is a ratio that has been used by visual artists for centuries as an aid to composition. When two things are in the proportion of 1:1.618 (approximately 3 to 5) they are said to be in the golden mean. I will not get into the detail of the golden mean and will just stick to the simplified rule of thirds. In my painting above, I have segmented the painting with a three-by-three grid. You can see how I have bisected the painting with the horizon. This is often frowned upon as it is thought to make the painting overly symmetric. But there are no rules in art so strict you must follow without second thought. Related to the rule of odds is the observation that triangles are an aesthetically pleasing implied shape within an image. In a canonically attractive face, the mouth and eyes fall within the corners of the area of an equilateral triangle. 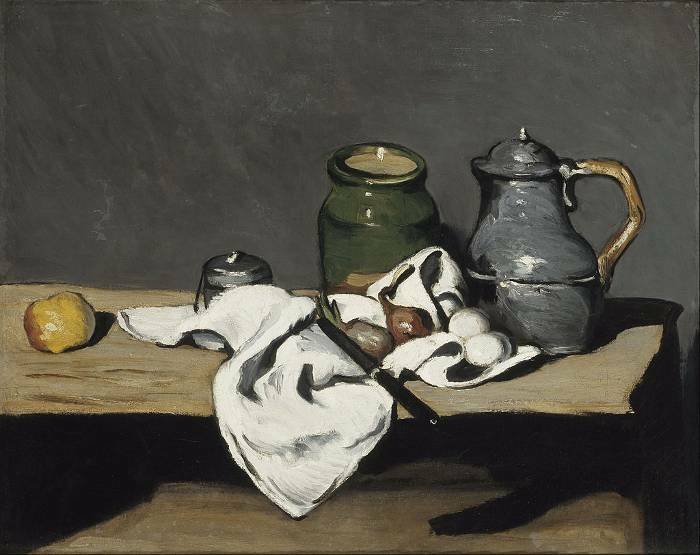 Paul Cézanne successfully used triangles in most of his compositions of still life scenes. A triangular format creates a sense of stability and strength. You will hear many 'rules' which are touted for creating an interesting composition. However you should not consider these as rules you must strictly follow. Instead, you should think of these rules as rough guidelines or suggestions to aid your decision making process. For every 'rule' there are many brilliant paintings which have broken it. Please include attribution to https://drawpaintacademy.com with this graphic. In your work no spaces between the objects should be the same. They should vary in shape and size. That creates a much more interesting image. Understanding composition is a fundamental part of being an artist, no matter what medium you practice. It is the ability to curate your own story using the visual elements. I believe you should think of composition not as a set of strict rules, but as a general mindset when creating your artwork. I hope you found this post useful. If you have any thoughts or comments, please share them in the section below.